The cervical spine is made up of the first 7 vertebrae, referred to as C1-7 (see the images below). It functions to provide mobility and stability to the head while connecting it to the relatively immobile thoracic spine. The cervical spine may be divided into 2 parts: upper and lower. 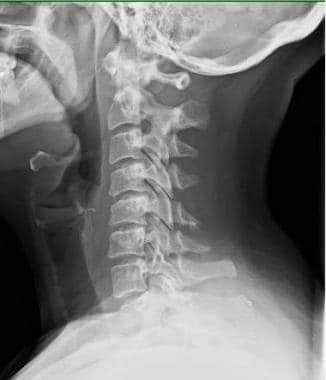 Lateral radiograph of cervical spine showing all 7 vertebrae. The upper cervical spine consists of the atlas (C1) and the axis (C2). 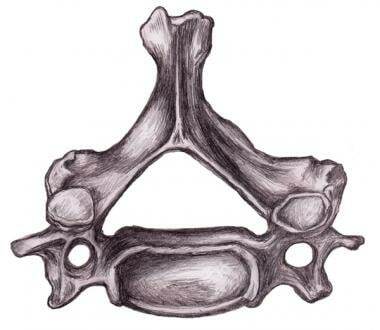 [1, 2, 3, 4] These first 2 vertebrae are quite different from the rest of the cervical spine (see the image below). The atlas articulates superiorly with the occiput (the atlanto-occipital joint) and inferiorly with the axis (the atlantoaxial joint). The atlantoaxial joint is responsible for 50% of all cervical rotation; the atlanto-occipital joint is responsible for 50% of flexion and extension. The unique features of C2 anatomy and its articulations complicate assessment of its pathology. Cervical spine. Note uniquely shaped atlas and axis (C1 and C2). The atlas is ring-shaped and does not have a body, unlike the rest of the vertebrae. Fused remnants of the atlas body have become part of C2, where they are called the odontoid process, or dens. The odontoid process is held in tight proximity to the posterior aspect of the anterior arch of the atlas by the transverse ligament, which stabilizes the atlantoaxial joint. The apical, alar, and transverse ligaments, by allowing spinal column rotation, provide further stabilization and prevent posterior displacement of the dens in relation to the atlas. The atlas is made up of a thick anterior arch, a thin posterior arch, 2 prominent lateral masses, and 2 transverse processes. The transverse foramen, through which the vertebral artery passes, is enclosed by the transverse process. On each lateral mass is a superior and inferior facet (zygapophyseal) joint. The superior articular facets are kidney-shaped, concave, and face upward and inward. These superior facets articulate with the occipital condyles, which face downward and outward. The relatively flat inferior articular facets face downward and inward to articulate with the superior facets of the axis. According to Steele's rule of thirds, at the level of the atlas, the odontoid process, the subarachnoid space, and spinal cord each occupy one third of the area of the spinal canal. The axis has a large vertebral body, which contains the odontoid process (dens). The odontoid process articulates with the anterior arch of the atlas via its anterior articular facet and is held in place by the transverse ligament. The axis is composed of a vertebral body, heavy pedicles, laminae, and transverse processes, which serve as attachment points for muscles. The axis articulates with the atlas via its superior articular facets, which are convex and face upward and outward. C2 has a complex embryologic development. It is derived from 4 ossification centers: 1 for the body, 1 for the odontoid process, and 2 for the neural arches. The odontoid process fuses by the seventh gestational month. At birth, a vestigial cartilaginous disc space called the neurocentral synchondrosis separates the odontoid process from the body of C2. The synchondrosis is seen in virtually all children aged 3 years and is absent in those aged 6 years. The apical portion of the dens ossifies by age 3-5 years and fuses with the rest of the structure around age 12 years. This synchondrosis should not be confused with a fracture. Parts of the occiput, atlas, and axis are derived from the proatlas. The hypocentrum of the fourth sclerotome forms the anterior tubercle of the clivus. The centrum of the proatlas sclerotome becomes the apical cap of the dens and the apical ligaments. 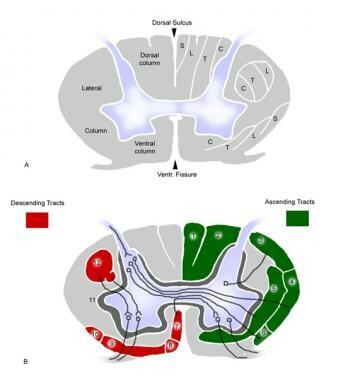 The neural arch components of the proatlas are divided into rostral and ventral components. The rostral component forms the anterior portion of the foramen magnum and the occipital condyles; the caudal component forms the superior part of the posterior arch of the atlas and the lateral atlantal masses. The alar and cruciate ligaments are formed from the lateral portions of the proatlas. There is an extensive arterial anastomotic network around the dens, fed by the paired anterior and posterior ascending arteries arising from the vertebral arteries around the C3 level and the carotid arterial arcade from the base of the skull. The anterior and posterior ascending arteries reach the base of the dens via the accessory ligaments and run cephalad at the periphery to reach the tip of the process. The anastomotic arcade also receives tributaries from the ascending pharyngeal arteries that join the arcade after passing through the occipital condyle. The 5 cervical vertebrae that make up the lower cervical spine, C3-C7, are similar to each other but very different from C1 and C2. 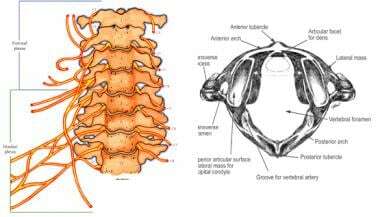 Each has a vertebral body that is concave on its superior surface and convex on its inferior surface (see the image below). On the superior surfaces of the bodies are raised processes or hooks called uncinate processes, each of which articulates with a depressed area on the inferior lateral aspect of the superior vertebral body, called the echancrure or anvil. Normal anatomy of lower cervical spine. These uncovertebral joints are most noticeable near the pedicles and are usually referred to as the joints of Luschka. They are believed to be the result of degenerative changes in the annulus, which lead to fissuring in the annulus and the creation of the joint. These joints can develop osteophytic spurs, which can narrow the intervertebral foramina. The spinous processes of C3-C6 are usually bifid, whereas the spinous process of C7 is usually nonbifid and somewhat bulbous at its end. The subaxial cervical spine can conveniently be divided into anterior and posterior columns. The anterior column consists of the typical cervical vertebral body sandwiched between supporting disks. The anterior surface is reinforced by the anterior longitudinal ligament and the posterior body by the posterior longitudinal ligament, both of which run from the axis to the sacrum. In the neuroanatomy of the cervical spine (see the image below), the cord is enlarged, with lateral extension of the gray matter consisting of the anterior horn cells. The lateral dimension spans 13-14 mm, and the anterior-posterior extent measures 7 mm. An additional 1 mm is necessary for cerebrospinal fluid (CSF) anteriorly and posteriorly, as well as 1 mm for the dura. A total of 11 mm is needed for the cervical spinal cord. Exiting at each vertebral level is the spinal nerve, which is the result of the union of the anterior and posterior nerve roots. Cross-sectional anatomy of cervical spinal cord. The foramina are largest at C2-C3 and progressively decrease in size down to C6-C7. The spinal nerve and spinal ganglion occupy 25-33% of the foraminal space. The neural foramen is bordered anteromedially by the uncovertebral joints, posterolaterally by facet joints, superiorly by the pedicle of the vertebra above, and inferiorly by the pedicle of the lower vertebra. Medially, the foramina are formed by the edge of the end plates and the intervertebral discs. Interconnections are present between the sympathetic nervous system and the spinal nerve proper. The spinal nerves exit above their correspondingly numbered vertebral body from C2-C7. 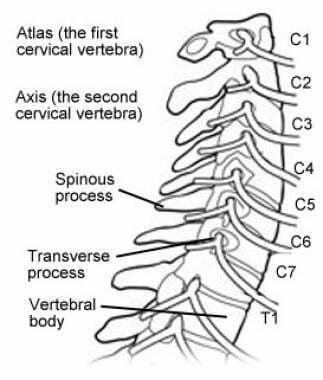 Because the numbering of the cervical spinal nerves commences above the atlas, 8 cervical spinal nerves exist, with the first exiting between the occiput and the atlas (C1) and the eighth exiting between C7 and T1. The vascular anatomy consists of a larger anterior spinal artery located in the central sulcus of the cord and paired posterior spinal arteries located on the dorsum of the cord. It is generally accepted that the anterior two thirds of the cord is supplied by the anterior spinal artery and that the posterior one third is supplied by the posterior arteries. The fibrous capsules are innervated by mechanoreceptors (types I, II, and III), and free nerve endings have been found in the subsynovial loose areolar and dense capsular tissues. In fact, there are more mechanoreceptors in the cervical spine than in the lumbar spine. This neural input from the facets may be important for proprioception and pain sensation and may modulate protective muscular reflexes that are important for preventing joint instability and degeneration. The facet joints in the cervical spine are innervated by both the anterior and posterior rami. The atlanto-occipital and atlantoaxial joints are innervated by the anterior rami of the first and second cervical spinal nerves. The C2-C3 facet joint is innervated by 2 branches of the posterior ramus of the third cervical spinal nerve innervate, a communicating branch and a medial branch known as the third occipital nerve. The remaining cervical facets, C3-C4 to C7-T1, are supplied by the posterior rami medial branches that arise 1 level cephalad and caudad to the joint. [11, 12] Therefore, each joint from C3-C4 to C7-T1 is innervated by the medial branches above and below. These medial branches send off articular branches to the facet joints as they wrap around the waists of the articular pillars. 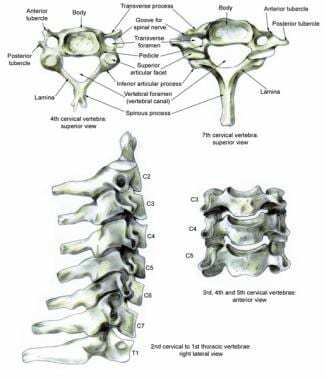 Intervertebral discs are located between the vertebral bodies of C2-C7. Intervertebral disks are located between each vertebral body caudad to the axis. These disks are composed of 4 parts: the nucleus pulposus in the middle, the annulus fibrosis surrounding the nucleus, and 2 end plates that are attached to the adjacent vertebral bodies. They serve as force dissipators, transmitting compressive loads throughout a range of motion. The disks are thicker anteriorly and therefore contribute to normal cervical lordosis. Although the cervical spine consists of 7 cervical vertebrae interspaced by intervertebral disks, the complex ligamentous network keep the individual bony elements behaving as if they were a single unit. The longitudinal ligaments are vital for maintaining the integrity of the spinal column. Whereas the anterior and posterior longitudinal ligaments maintain the structural integrity of the anterior and middle columns, the posterior column alignment is stabilized by a complex of ligaments, including the nuchal and capsular ligaments, and the ligamentum flavum. If 1 of the 3 columns is disrupted as a result of trauma, stability is provided by the other 2, and cord injury is usually prevented. With disruption of 2 columns, spinal cord injury is more likely because the spine may then move as w separate units. The alar ligaments run from the lateral aspects of the dens to the ipsilateral medial occipital condyles and to the ipsilateral atlas. They prevent excessive lateral and rotational motion while allowing flexion and extension. If the alar ligaments are damaged, as in whiplash, the joint complex becomes hypermobile, which can lead to kinking of the vertebral arteries and stimulation of nociceptors and mechanoreceptors. This may be associated with the typical complaints of patients with whiplash injuries (eg, headache, neck pain, and dizziness). The supraspinous ligament, the interspinous ligaments, and the ligamentum flavum maintain stability between the vertebral arches. The supraspinous ligament runs along the tips of the spinous processes, the interspinous ligaments run between adjacent spinous processes, and the ligamentum flavum runs from the anterior surface of the cephalad vertebra to the posterior surface of the caudad vertebra. The interspinous ligament and (especially) the ligamentum flavum control for excessive flexion and anterior translation. [19, 20, 21] The ligamentum flavum also connects to and reinforces the facet joint capsules on the ventral aspect. The ligamentum nuchae is the cephalad continuation of the supraspinous ligament and has a prominent role in stabilizing the cervical spine. Malanga GA. The diagnosis and treatment of cervical radiculopathy. Med Sci Sports Exerc. 1997 Jul. 29(7 Suppl):S236-45. [Medline]. Tong HC, Haig AJ, Yamakawa K. The Spurling test and cervical radiculopathy. Spine (Phila Pa 1976). 2002 Jan 15. 27(2):156-9. [Medline]. Fryholm R. Cervical nerve root compression resulting from disc degeneration and root-sleeve fibrosis. Acta Chirurg Scand. 1951. 160(suppl):1-149. Tubbs RS, Salter EG, Oakes WJ. The accessory atlantoaxial ligament. Neurosurgery. 2004 Aug. 55(2):400-2; discussion 402-4. [Medline]. Milligram MA, Rand N. Cervical spine anatomy. Spine State of the Art Reviews. 2000. 14(3): 521-32. McLain RF. Mechanoreceptor endings in human cervical facet joints. Spine (Phila Pa 1976). 1994 Mar 1. 19(5):495-501. [Medline]. Bogduk N. The clinical anatomy of the cervical dorsal rami. Spine (Phila Pa 1976). 1982 Jul-Aug. 7(4):319-30. [Medline]. Bogduk N, Windsor M, Inglis A. The innervation of the cervical intervertebral discs. Spine (Phila Pa 1976). 1988 Jan. 13(1):2-8. [Medline]. Franson RC, Saal JS, Saal JA. Human disc phospholipase A2 is inflammatory. Spine (Phila Pa 1976). 1992 Jun. 17(6 Suppl):S129-32. [Medline]. Fielding JW, Cochran GB, Lawsing JF 3rd, Hohl M. Tears of the transverse ligament of the atlas. A clinical and biomechanical study. J Bone Joint Surg Am. 1974 Dec. 56(8):1683-91. [Medline]. Menezes AH. Craniocervical fusions in children. J Neurosurg Pediatr. 2012 Jun. 9(6):573-85. [Medline].